Identify impacts of climate change on the Earth system. List anticipated effects of future climate change and determine which are considered most likely. Explain how tropical forests affect and are affected by a changing climate. 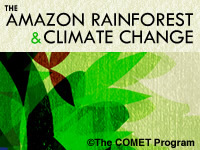 Explain how deforestation can affect precipitation in the Amazon. List some secondary impacts from deforestation of the Amazon. Describe the main sources of Brazil’s contributions to global greenhouse gases. Identify the main international agreements that have been in place to address global climate change. Describe what the REDD Program is and explain its main purpose. July 2014: The material presented in this lesson was current as of 2008 and thus the graphics are based on Coupled Model Intercomparison Project phase 3 (CMIP3). Additionally, while the lesson states that El Ninos have become more lengthy, it is now known that that trend from the 1990s has not continued.